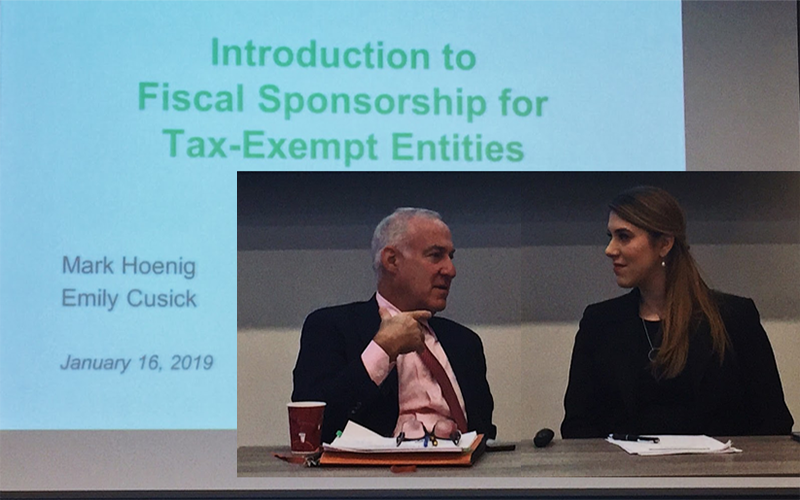 Nearly 40 New York nonprofit leaders attended a recent free capacity building workshop on fiscal sponsorship for emerging nonprofits led by expert pro bono attorneys from Weil, Gotshal & Manges LLP. Weil, Gotshal & Manges LLP attorneys Mark Hoenig, Partner and Emily Cusick, Associate explained the definition of fiscal sponsorship and how it works, reasons organizations decide to use a fiscal sponsor, types of sponsorship and their benefits as well as risks, and resources on existing fiscal sponsor organizations. From this workshop, participants walked away understanding how fiscal sponsorship can serve as a viable alternative to creating a 501(c)(3) organization, recognizing that fiscal sponsorship can be a helpful stepping stone for organizations waiting to establish their own 501(c)(3) status, and learning more about the legal nuances and details of fiscal sponsorship. The workshop was co-sponsored by NYLPI and Foundation Center New York, our longstanding capacity building partner. Our upcoming workshop on February 13th on Nonprofit Incorporation and Tax Exemption will spell out the process for incorporating a nonprofit entity and obtaining tax-exempt status. If you’re interested in attending, register here.